Forget about Thanksgiving dinner. I can’t wait until the day after Thanksgiving for leftovers. When else during the year can you look forward to turkey soup, turkey liver pate, smoked turkey sandwiches, and turkey hash in a single day? All this month, I’ve been telling you some of my favorite ways to cook turkey on the grill. You’ve mastered my spit-roasted adobo-marinated Cuban turkey with mojo. You’ve brined the bird in bourbon and smoked it over maple wood. You’ve even cooked turkey on an oversize beer can. I hope you’ve managed to squirrel away a pound or so of the cooked turkey meat for hash. 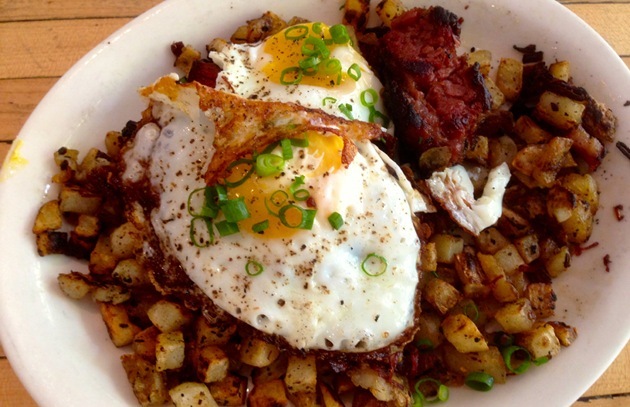 Hash originated as a way to use up leftovers, but it now turns up not just at hash houses (a nickname for diners) but at highfalutin restaurants from coast to coast. The most common version of hash contains corned beef and potatoes, but you can make hash with an almost endless variety of ingredients. Rural New Englanders combined corned beef, potatoes, and beets to make red flannel hash. In seafaring communities, it was common to find salt cod and fish hash. Hachis parmentier, garlicky chopped lamb and potatoes, is classic comfort food in France. Two philosophical schools dominate the world of hash hounds. One school consists of the grinders, who like to chop the ingredients to a fine harmonious mush. The other school takes a more pointillistic approach, leaving the ingredients in large pieces so you can appreciate the flavor and texture of each. My personal preference runs to the latter—especially when it comes to turkey hash, ideally made with meaty chunks of smoked turkey left over from Thanksgiving dinner. Get the Smoked Turkey Hash recipe.